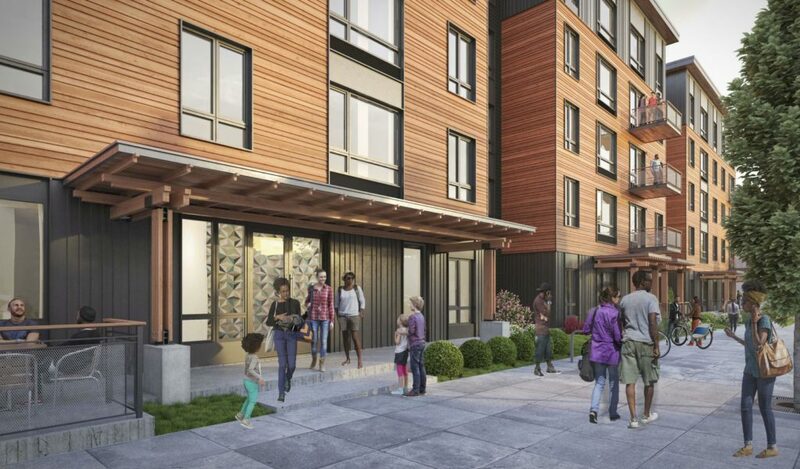 The Marquam Hill Apartments by Steelhead Architecture will include 72 units split between three buildings. Every week, the Bureau of Development Services publishes lists of Early Assistance applications, Land Use Reviews and Building Permits processed in the previous week. We publish the highlights. This post covers April 8th to April 14th, 2019. Place holder DA request. Applicant is hoping for June 6th and again on July 11th. Note Pre-app EA 19-147103. 60 units of low-barrier permanent supporting housing. They will eventually need/want the info related to the RM2 zoning (through the Better Housing by Design). Development of a 23-story building. 11 stories will be used for a new Hyatt Place brand hotel (170 rooms). 12 stories will be used for a new residential apartment community (110 one-bedroom and studio units). 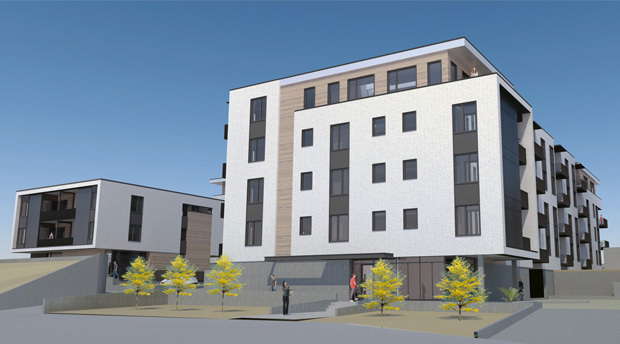 New 3-story, 28-unit modular apartment building with trash enclosure and associated site work. 1 of 3 new 5 story 40 units multifamily building on consolidated tax lots and associated siteworks includes trash enclosure and parking. Ground floor includes parking, stair and lobby. 2 of 3 new 5 story 24 units multifamily building on consolidated tax lots and associated siteworks includes trash enclosure and parking. Ground floor includes parking, stair and lobby. 3 of 3 new 3 story 8 units multifamily building on consolidated tax lots and associated siteworks includes parking. Construction of new 6-unit apartment building with fire sprinkler room; 40 sq ft trash enclosure and associated sitework. Existing house to remain. Mechanical permit to be separate. New 3 story apartment building with 19 units and associated site work. No off street parking. Lloyd Center owner Cypress Equities is now proposing a revised concept for the east end theater addition to the mall. 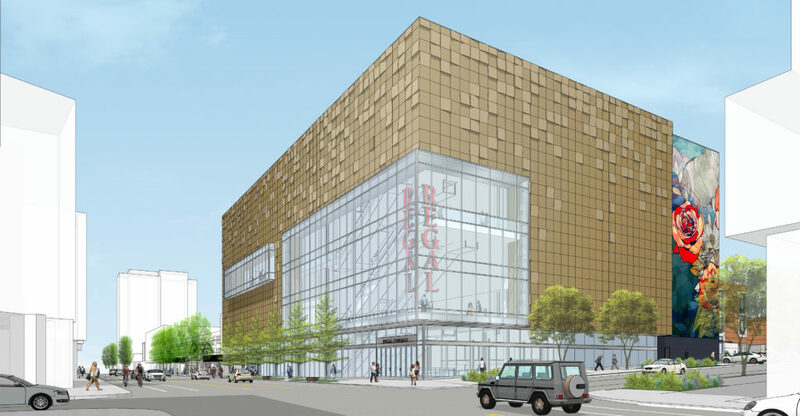 Instead of incorporating the Sears building into the new cinema, as originally proposed, a taller cinema will be built to the south of the Sears anchor building. The Sears building will be retained and renovated into an office building. Every week, the Bureau of Development Services publishes lists of Early Assistance applications, Land Use Reviews and Building Permits processed in the previous week. We publish the highlights. This post covers February 18th to February 24th, 2019. 16 unit apartment building in the Hollywood Pedestrian District, CM3d zone. Lobby with mail area on the first floor with interior long term bike parking in the back of the structure. The redevelopment of the East end of the Lloyd Center will be composed of two major projects. 1. Renovate and expansion of the existing 145,000 sf anchor building (former Sears). 2. Construction of a 70,000 sf theater building containing 13 theaters. 29,000SF 2-story brick office building to be the headquarters for Harder Mechanical Contrators. Building is on the Southeast corner of MLK and Thompson. Private surface parking to the east/behind the building with enterance off of Thompson. Site is non-contributing to the Eliot Conservation District. 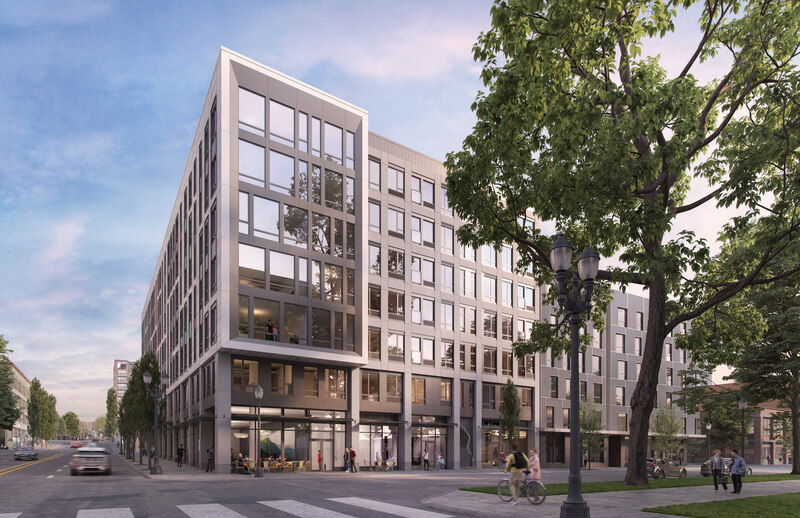 The project consist of a 54,000 gsf, 5-story core and shell office building in the historical district, at SW 1st Ave and SW Pine St. The building house PAE’s Portland office and other tenants. It includes retail spaces ata the ground floor. Build 3 story 18 units apartment building. Mechanical separate. New 3-story 9 unit apartment building with trash room and bike room;with associated site work. Design Advice has been offered on the Holden of Pearl, a proposed senior living facility being designed by Ankrom Moisan Architects for Alliance Realty Partners. The 16-story building would include 241 residential and group living units, with 149 parking stalls in a below grade parking garage. 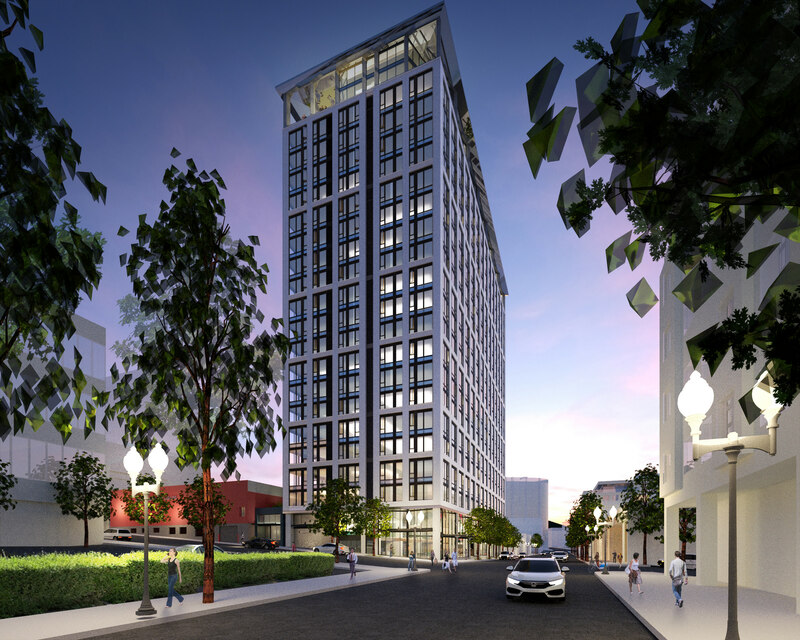 The Design Commission has approved the ART Tower, a 21-story mixed use tower in the Goose Hollow neighborhood design by Ankrom Moisan Architects for Wood Partners. The building will rise to a height of 224′, and include 314 residential units over 4,000 sq ft of ground-floor retail space. 215 vehicular parking spaces will be provided in three level of underground parking. The ART Tower tower is the first high rise to be approved since the adoption of the city’s inclusionary housing rules, which require the provision of affordable housing or the payment of a fee-in-lieu. Every week, the Bureau of Development Services publishes lists of Early Assistance applications, Land Use Reviews and Building Permits processed in the previous week. We publish the highlights. This post covers October 29th to November 4th, 2018. Proposed project is a senior living community with 110 units of R-2 occupancy independent senior living, 131 parking stalls in below-grade parking with total GSF of 296,500 with 42,000 of that amount being below-grade parking. Active uses will be provided along 13th Avenue (per 33.510.225). Those may be lobby, bistro, admin offices, salon or other similar uses complimentary to the community and to development objectives stated for NW 13th Ave.
Construction of a new 5-story building (57,000 gsf). Multi-use tenants will include retail and building support spaces on level 1. Office space levels 2-5. The proposed five-story development is composed of assisted living and memory care units in a single building each caring for the specific needs of its residents. The building interior design provides for an abundance of amenities, which include the following: common dining spaces and serving areas, activity areas, art studio, theater, chapel, cafes, lounges, a fitness and activity center, beauty salon/barber shop, private dining for family events and central kitchen for chef-inspired meals. Assisted living and memory care each have their own individually landscaped courtyard. Multi-use building with 138 residential apartments on levels 2 thru 6 (90,775 sf), residential amenities on ground floor and roof deck (4,305 sf), retail spaces on ground floor (8,785 sf), and 49 spaces of below grade parking. Type 1A construction from bottom of garage to top of slab of level 3. Type 3A construction from top of slab of level 3 to roof. Construct new 11,993 sf single story retail building. Phase 1- construct north portion and one tenant space occupied as pawn shop and 3 tenant spaces not occupied this phase. Phase 2- demolish existing adacent structure in permit 18-260694-CO. Phase 3- construct south portion of building with one occupied pawn shop tenant, parking lot and site work. One phase 1 tenant space to be occupied as dispensary in phase 3. See comments. New 30 unit multi-family housing complex of 3 story buildings with lower level private garages, bike parking: this building contains 24 units. Trash enclosure under 120 sq ft. Included associated site work. 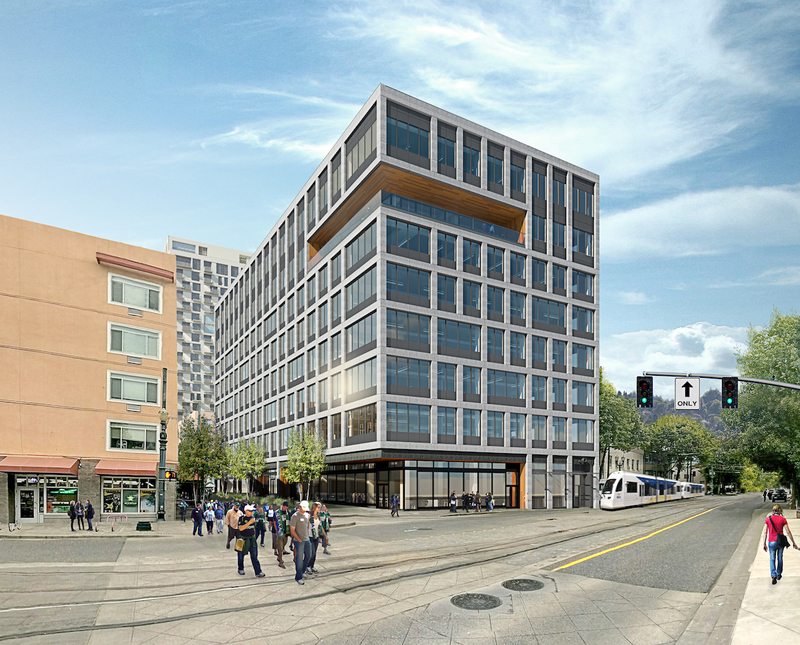 A building permit has been issued for the first phase of the Press Blocks, the 8-story Canvas office building. Every week, the Bureau of Development Services publishes lists of Early Assistance applications, Land Use Reviews and Building Permits processed in the previous week. We publish the highlights. This post covers October 15th to October 21st, 2018. Proposal is for a master plan development and possible land division of approx. 8 acres. 4-Story, 140 Unit affordable housing project with 3 floors of residential over on-grade parking, community space and additional residences. The project will also feature a mid-block pedestrian crossing and public plaza facing Killingsworth. On-site storm water disposal will be accomplished through dry wells. New 2 story 3 unit apartments. each unit with attached garage and driveway and associated with site works. Building 3 of new 30 unit multi-familly housing unit complex; this building contains 3 units; 3 story buildings with lower level private garages. Included associated site work. 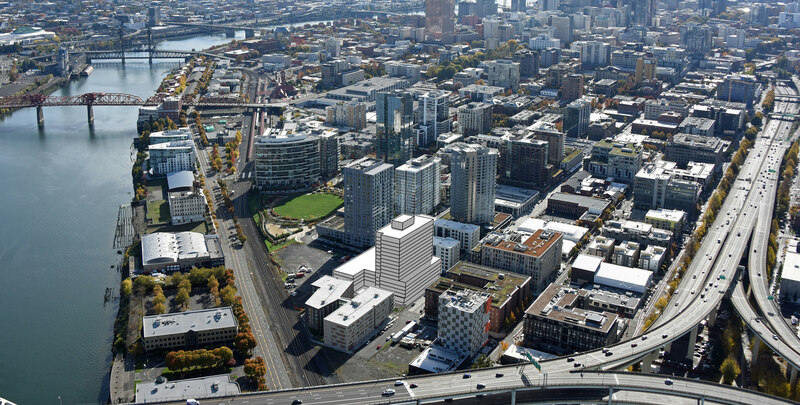 The Design Commisson has approved a mixed use building at 815 W Burnside St. 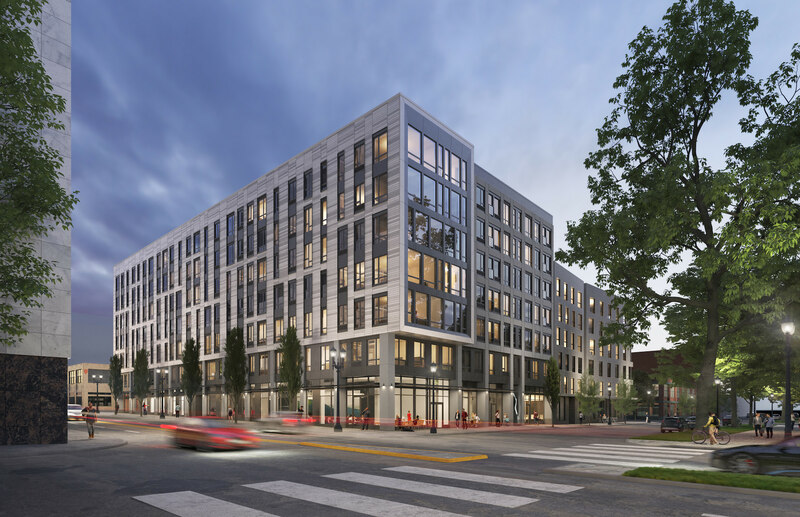 The 7 story building is being designed by Ankrom Moisan Architecture for LMC Development, and will include 138 residential units, ground-floor commercial space, 50 below-grade parking spaces, and a rooftop outdoor deck. 214 bicycle parking stalls will be provided, split between 84 racks in ground floor bicycle rooms and 130 in-unit racks. 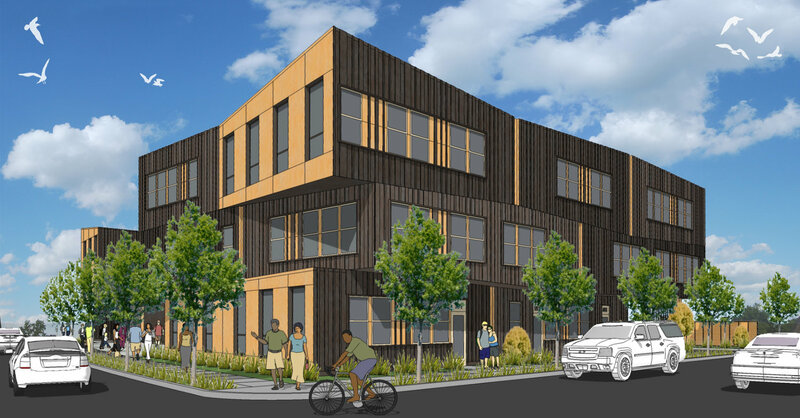 A proposed development in the Central Eastside has gone in front of the Design Commission for three Design Advice Request (DAR) meetings. The 8-story Grand Avenue Mixed Use Apartments are being designed by Ankrom Moisan Architecture for developer Fairfield Residential. As presented at its most recent DAR, the project would include 170 residential units, over approximately 5,000 sq ft of retail space. 51 vehicular parking spaces would be provided in a garage, located partially below grade. The building will be subject to the city’s inclusionary housing rules, which require the provision of affordable housing or the payment of a fee-in-lieu.